A new Hindu movement based in Germany has come up with a different approach to dealing with the camps’ sinister legacy. 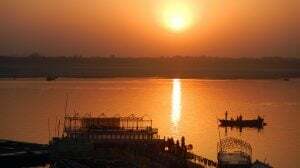 The group, called Bhakti Marga, organizes sessions of followers calmly chanting “om,” the sacred mantra of Hinduism, to “purify” the sites by turning their negativity into positive energy. Whenever it applies for permission to chant at a memorial, the same questions arise. Is this simply a religious ceremony like the prayers that Christian and Jewish groups regularly hold at these sites? Or does the ritual somehow aim to whitewash history, an agenda the memorials are all too familiar with from neo-Nazis and Holocaust deniers? 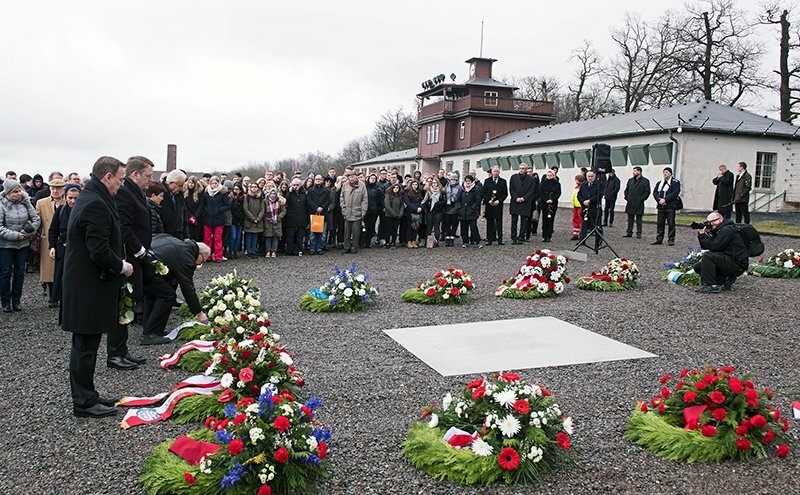 Officials at the memorials, German Jewish groups, historians and other intellectuals have debated the issue, with responses ranging from an enthusiastic embrace of perceived allies against racism to outrage over efforts seen as a whitewashing and denial of history. 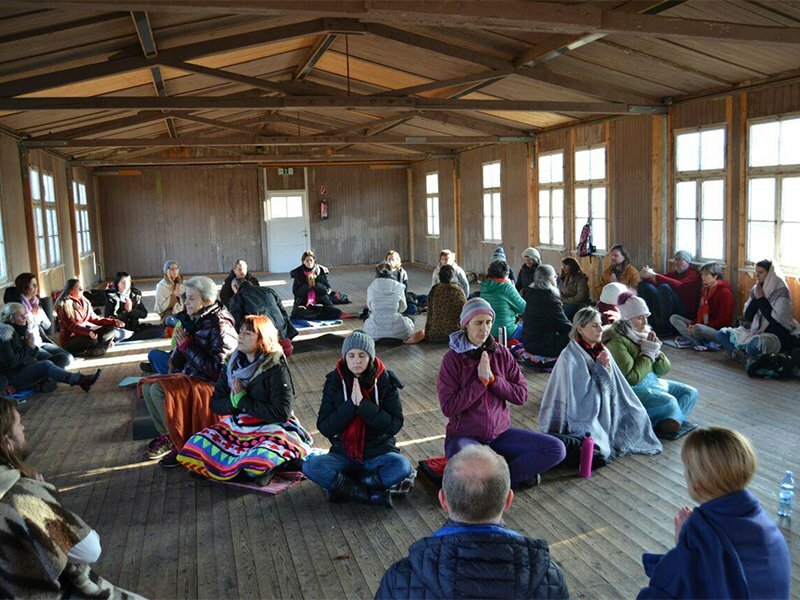 Bhakti Marga, whose name means “path of devotion” after an ancient Hindu devotional rite it practices, held a chanting session this month in the memorial at Buchenwald, with support from the administration of the camp memorial and the local Jewish community. Last year, it held similar om chantings at the memorial in Mauthausen, the largest concentration camp in Austria, and Terezin (Theresienstadt) in the Czech Republic, which Nazi propaganda used to portray as a model wartime internment camp. “What happened in these places is still happening in the etheric and astral realms. 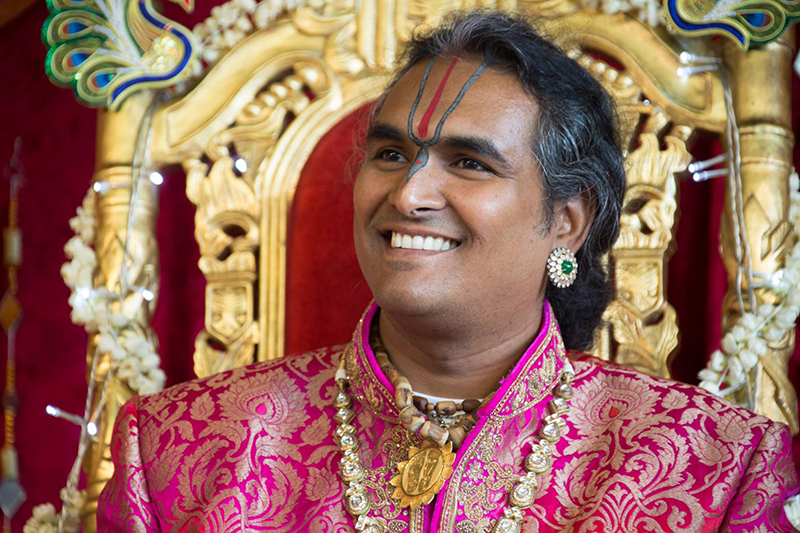 Only om has the power to heal these places,” said the group’s 39-year-old swami from Mauritius, Paramahamsa Vishwananda, referring to states of consciousness in Hindu philosophy. Bhakti Marga, which has its main ashram in the countryside near the western German city of Wiesbaden, says its followers held chantings at negatively energized sites in Austria, Croatia, Slovakia, Czech Republic, Germany, Poland, Japan, Belgium and the United States on Feb. 24. Its main ashram could not give details. Founded in 2005, the group says it has followers in 52 countries and 30 temples in 19 of them and argues that its chantings are purely religious. “Om Chanting is a free group practice that uses the transformational power of Om to activate the self-healing potential of participants,” it explains on its website. The negative vibrations at these Nazi sites are palpable, the group claims. When about three dozen followers recently went to chant in Hadamar, the site of a Nazi euthanasia center not far from the ashram, they reported that two of them vomited along the way because the negative energy was too strong. When another group of about three dozen chanted in Mauthausen last December, its newsletter said several participants were so moved they broke into tears. “Many of us could hear beautiful voices like angels singing; one devotee could hear an old airplane with falling bombs,” it said. Administrators at concentration camp memorials routinely grant requests from Christian and Jewish groups to pray on their premises, but Bhakti Marga has confronted them with a very different religious tradition. “We’re used to Protestant, Catholic and Jewish groups. 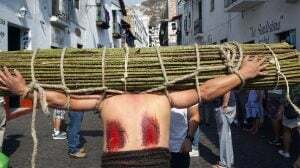 We’re not used to Hindu groups but we see no reason to ban the Hindus from doing this,” Rikola-Gunnar Lüttgenau, spokesman for the Buchenwald memorial, told the local television station MDR during the rite there on March 17. “We have investigated to see if the history of the place is being negated. That is not the case. We’ve looked to see if they take this place seriously. That is the case,” he said. Reinhard Schramm, head of the Jewish community in Thuringia state, had no problem meeting the Hindus. “If people knowingly want to visit a memorial site where 56,000 people were murdered, and want to help prevent that from ever happening again, then that’s reason enough for me to speak with them,” he told DLF radio. Willi Mernyi, chairman of the Mauthausen Committee that oversees the memorial there, said he saw the om chanting session as one of many ways to pay respect and he did not want to judge the chanters. The memorial at Flossenbürg in northern Bavaria — the camp where the Lutheran theologian Dietrich Bonhoeffer and Adm. Wilhelm Canaris were executed in April 1945 for plotting to kill Hitler — turned down a Bhakti Marga request to chant there last month. Its director, Jörg Skriebeleit, said the group’s request led to a long discussion with administrators of other memorials in Bavaria and the final decision to deny permission. “The goal of ‘purifying the site’ and ‘healing the past’ is in our view an inappropriate manipulation of the site and an inappropriate exploitation of the fate of every single victim,” he wrote in his reply. “This is an ineffective method that replaces education and enlightenment, which is what the memorials are actually for and what they do every day,” said Jan Schneider, one of four young people braving a snowstorm to hold their protest. The Antisemitism Research and Information Center in Berlin also had its reservations about the rite. “The chantings do not deal with the specific history of these places,” its spokesman Alexander Rasumny told the daily Die Welt, noting the list of places the group wants to “purify” ranges from concentration camp memorials to sites where American Indians were massacred. 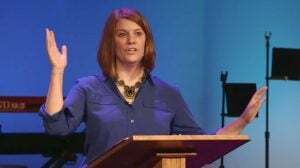 Heike Beck, a minister for interfaith relations in the Protestant church district where the Bhakti Marga ashram is located, said the fact the group always used the same ritual at sites marked by different kinds of tragedies did not seem right to her. Zionists don’t want to rise above the atrocities of this holocaust because it provides a convenient excuse to continue their 135 year old creeping invasion of Palestine. They apply the tactics of the Nazis to their attempt to dominate Palestinians and steal their lands. Another screaming nutball trying to appropriate the Holocaust. If Israel applied the same tactics as Nazis did, you would not be making your statement in the present tense. Palestinians would be a distant memory of history. There would have been a Palestinian state (or two) in 1997 had Yassir Arafat not used suicide bombers as negotiation tools. The person who said the foregoing was perceptive. The Indian traditions are orthogonal to history, but overlap with (a) psychology and (b) cognitive sciences. The Indian traditions have technical terms like klesha and vasana, which roughly equal the English phrases “conditioned response”, cognitive dissonance”, “emotional baggage”, and the like. As I said, Zionists are conducting a stealthy, creeping invasion of Palestine complete with exile, concentration camps, and genocide. BDS . FYI: Arafat was defending his lands against the Zionist invader. Why legitimize that aggression. A two state solution would only have given in to Zionist predations. So stealthy and Nazi like that it produces the opposite effect of actual Nazi-like tactics: A population which has increased dramatically since occupation with international political influence. That was too stupid and ignorant for words. Arafat was at the NEGOTIATIONS TABLE. He was trying to use Israeli reprisals to bolster his image against rivals Hamas. Rabin was acting in good faith and took a bullet in the name of peace. Arafat was trying to keep a lid on factionalism in his own group and ruined the best hope for nationhood his people had. You guys always like to forget about the fratricidal Palestinian civil war which flared up after Oslo fell apart. A “one state” solution means the eradication of Israel. How genocidal. And you accuse others of being Nazi-like? LOL! Of course now its really a 3 state solution since Hamas created a de facto state in Gaza. But its not like ignorant fools using that well worn trolling trope of yours really pay attention to decades old facts and details. Demons are not real, Sandi. If you see demons, you should probably go see a doctor. Sorry, I believe Christ, not you. “The goal of ‘purifying the site’ … is” … an IMPOSSIBILITY at this time. Nor when Jesus returns. In fact, He:ll just annihilate it. DONE. Are “klesha and vasana” historicistic, then? In fact, is Hinduism so too? No, klesha and vasana are not historicistic. Take two different events, say, the depopulation of Native Americans, and the depopulation of Jewish people. A historian would say that the (historical) dynamics of the two events are different. A psychologist, however, might say that the (psychological) dynamics of the two events are the same or related. The Indian traditions are somewhat close to psychology and somewhat far from history. The words “klesha” and “vasana” are used in yoga circles, so I thought of throwing them in to buttress the point that the Indian traditions are somewhat close to psychology. As to the word “Hinduism”–it is a band-aid solution, or a stop-gap solution. It is not native to us, i.e., old books do not use the word. Muslims started using the word “Hindu”, then Western Indologists began to use the word “Hindu”. Hinduism “IS … native” to this article – like 8 times being mentioned. Yet your rebuttal is, “‘Hinduism’ … is not native to us”? In other words, when “Heike Beck”, whom you showcased in your comment, bad-mouthed “the Bhakti Marga ashram” because with these Hindus, “History is denied and plays no role anymore” – that person’s historistic biases against Hinduism are showing! Not really. It require more faith to believe that, than it does that Christ exists. Sorry. The former is the dominant paradigm, in the sense that most social science textbooks (even in India) are written that way today. You keep ignoring the fact that Zionists began their invasion of someone else’s land, Palestine, in the 1880’s only after deciding against taking over Argentina or Uganda. Zionist should not be in Palestine. If a one state solution means the eradication of ersatz Israel, then so be it. They should not have invaded in the first place. Some “invasion” – all Jewish land purchased from Ottoman landlords. The acquiescence of the League of Nations. The creation of a Palestinian state and a Jewish state by the United Nations. Some hot-shot invasion. Works for me. No harm, no foul. Nope. Its just an irrelevancy to the modern political situation. Israel is the only country which people think its appropriate to argue its existence by invoking its history. The US is not going to be given back to the First Peoples, Italy is not going back to the Etruscans, and Taiwan is not going back to the Formosans. So we are left with dealing with what remains. What you are essentially doing is declaring your POV not worth taking seriously. Since you are not arguing anything which is going to happen, needs to happen, or is remotely useful. Fact is, Palestinians govern themselves with one part kleptocracy, one part theocracy. Support of them needs to be given a healthy dose of skepticism as to their own leadership. You advocate the eradication of Israel yet call them Nazi-like. My irony meter broke reading that. (2) Gallup poll in May 2001 asked Americans if the devil is something they believe in, something they’re not sure about, or something they don’t believe in. ALL OF YOUSE AMERICANS BETWEEN 57% AND 68% OF THE ENTIRE POPULATION. “GO SEE A DOCTOR”!!! says NoMoreBadTown. You know “whadda maroon”? You know what? Uh … carry on. Your effort in global peace is duly noted, my dear. Just as what Israelis are doing to Palestians “works for me”, you later on say (per below’s comment), “no harm. no foul”? Pragmatism at its best right there, folks. Whatever “works for Pennywhistler”! If you want to invoke history, then Arabs and Italians should control Palestine because they have occupied and ruled that territory for longer than Jews. In addition, the only reason were in Palestine in the first place was because they invaded it. This is just their second kick at the can. You are mistaken. The Ottoman Empire prohibited the sale of land to Jews. until its defeat in WW1. You are trying to invoke history to justify genocide. Yet accuse the people you want gone of being Nazi-like. There is nothing worth taking seriously in such arguments. Israel, like any nation does not cease to exist on the basis of spurious rhetoric. Its good to see your true colors. You advocate genocide while accusing others of it. My problem with irony meters are as soon as they come back from the shop, they get broken again from online discussion. If the devil is regarded as a symbol for the human ego, then it makes sense. prove it. You could be a bot. Cranks are always a great source of cheap entertainment! The topic is Hindus chanting at Nazi concentration camps. But you are a crank and cannot cope. Quelle domage. The Ottoman Land Code and Registration Laws of 1858 and 1859 only prohibited the sale of miri land – state land requiring official permission for transfer. The failure of Ottoman policy towards modern Jewish settlement in Palestine lay in the very real difficulties involved in putting the policy into practice. In 1893 Constantinople created a loophole big enough to nullify that edict for all practical purposes. The Jewish National Fund was founded in 1904 for the purpose of buying up land from Arabs. From the 1880s to the 1930s, most Jewish land purchases were made in the coastal plain, the Jezreel Valley, the Jordan Valley and to a lesser extent the Galilee. In the 1930s most land was bought from small landowners. Of the land that the Jews bought, 52.6% of the lands were bought from big non-Palestinian landowners, 24.6% from Palestinian-Arab landowners and only 9.4% from the Fellahin. Hindus are not doing anything to Nazi concentration camps. AS I clearly quoted, “We have investigated to see if the history of the place is being negated. That is not the case. We’ve looked to see if they take this place seriously. That is the case.” No harm, no foul. I know whadda maroon — you. Cranks are always a great source of cheap entertainment, but the topic is Hindus chanting at Nazi concentration camps. “Hindus are not doing anything to Nazi concentration camps [just as Israelis aren’t, y’know, to Palestinians]” – can I quote you on that? I can? WOW, thanks a million! That the majority believe in demons is irrelevant to their supposed existence. There are no stats on how many believe they’ve seen demons. With the exception of some fundamentalists most folks would urge you to seek medical help in you are seeing demons. What’s the significant difference between 57% to 68% of U.S. population “believ[ing] in the existence of the Devil” and however many that have “see[n] demons”? Oh I see. In your judgment – and NoMoreBadTown’s who’s now cowering on the sideline, going, Yeah, uh-huh, yup, what he said, Jim Johnson, sure, sure, youbetcha – it’s only the latter group who “should probably go see a doctor.” But not the 1st group, who’re OKEYDOKEY KARAOKE in your & NMBT’s Book of the Dead I mean the Atheist? That’s persuasive & Enlightenment-like, guys, as is OMMMMMmmmmmmmmmmmmmmmm. Facts seem to be beyond your powers. That’s OK – no need to respond. To believe what? That you’re actually getting a reply, unlike your prayers? Popular ghost-hunter Zac Bagans is now a believer in demons — after a nasty critter got ahold of his derriere in the dark. It took over his mind for a few minutes, in a very bad location. Mm-mmm. You do NOT want Stray-puppy following you home. Stray-puppy got sharp fangs and is very hungry. No honey. You are mistaken. He’s here and He loves you also. Yes, the topic was Hindus chanting at a Nazi concentration camp to purify the area. Nothing wrong with that except, of course, if the area was purified it would deprive Zionists of their artificial excuse for their invasion of Palestine which began 60 years before WW11. All very interesting I’m sure but starting in 1881 (right around the time that Zionists started their invasion of Palestine) the Ottoman government prohibited Jews from settling in Palestine and specifically included Jerusalem, Hebron, Safed and Tiberias as being out of bounds to Jews. Prior to the start of the Zionist invasion of Palestine there were 500,000 Palestinians in Palestine living peacefully with 50,000 Jews but the Zionist invasion slogan was “A land without people for a people without land” so even then the Zionist intent was to ethnic cleansing. He’s here? Where? Prove it. Cranks are your best source of cheap entertainment! Cranks are still your best source of cheap entertainment! Youi sure have changed a lot of minds here. Mazal tov! Yes, you are. Your support of ethnic cleansing is noted. He healed my dad of lung cancer, NoMore. You just need to look at the trees, and the sky, and the flowers and some of the towering buildings……the birds……..He is the creator. Your father’s doctors healed him. Get a grip, Sandi. I call BS on that. If he had no treatments, he never had cancer. Your doctors hate you. They spend so much time and money going through med school, and you can’t even give them the courtesy of acknowledging their hard work. That’s just sickening. lol…..did you even read my other comment? I did, and I don’t believe you. Anyway, you’re the one that chose to split the conversation from being linear into this superfluous off-shoot, so you only have yourself to blame. I call it you lying like a rug. He never had cancer. Most likely explanation is a misdiagnosis, or you’re just lying. Here’s your truth: spontaneous remission. Look it up, Sandi. No god needed. And Christ was responsible for it. Thanks for proving me right. I did. He was diagnosed. We prayed for him. It went away. You clearly don’t understand how evidence works, and would rather believe in fairy tale witchcraft. Not at all. You choose to believe in magic. I ask for evidence. “The human ego” is a psychological phenomenon, if you remember your college days taking Psych 101. No reference there to what you failed to learn at Psych 101, apparently.